The Run Home's Snowflake Christmas Ornament makes a unique gift! Use is as an Ornament, Gift Tag, Wall Hanging or Rear View Mirror Bling! The SWIM GIRL Ornament / Gift Tag measures 3 1/2 x 3 1/2 inches and is handcrafted out of vintage beads featuring a main bead color of your choice plus vintage clear and silver beads. 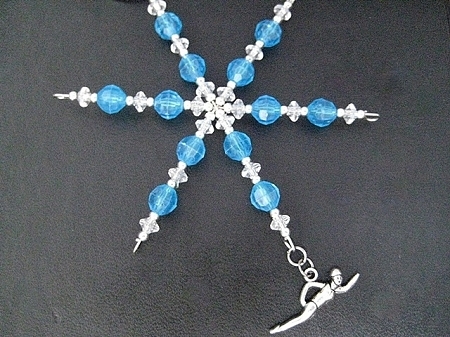 A pewter Swimmer Girl charm dangles from the bottom! Each Ornament comes with a silver stretch bow attached to the top ready to attach to a gift, a bunch of flowers, a bottle of wine, a potted plant, any gift you would like to give for any occasion! Celebrate the runner in your life! Available in Red Round, Emerald, Aqua, Turquoise, Amethyst, Gold, Red, Pink and Fuchsia faceted beads with clear and silver accent beads. Please remember as with every snowflake, no two ornaments will be exactly alike. Each ornament is hand beaded and hand stamped by me. There may be slight variations in beading order, diameter, letter stamping, alignment and coloring. Please consider these unique qualities to be a testament to the handmade nature of each piece. CUSTOM ORNAMENT - Choose your design! Choose your color!